It’s a place that’s practically empty on a Friday night, where there’s always a parking space right in front of clubs, and where high school kids can not only get into bars easily, but they can bypass the lines with ease and can be served alcohol — enough to get totally drunk. 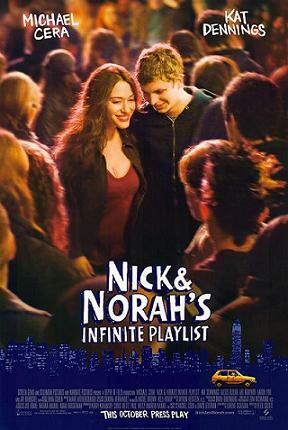 This is the New York of Nick & Nora’s Infinite Playlist, where everything is seemingly just right so as to engineer the kind of “crazy” night that may lead to an unlikely and rather forced love connection between our leads Nick (Michael Cera) and Nora (Kat Dennings). Infinite Playlist is that kind of movie, complete with a hip soundtrack, and made for a particular target audience that doesn’t really include me. In fact, I was probably the oldest person in the theater when I saw it. I didn’t awwww or laugh or enjoy the movie as much as the others seemed to. Not that Infinite Playlist is an entirely bad movie (I enjoyed Ari Graynor’s performance as Nora’s drunk friend, for example). It just feels really contrived and episodic and long. Sure, every movie romance is contrived on some level, but I had a hard time buying that these two had such an instant connection — as opposed to the pairs in other movies like Before Sunrise. And I was also distracted by the many cameos (Seth Meyers, Andy Samberg, John Cho, etc.). At some points, I wanted this flick to be more like a junior version of Love Is a Mix Tape, the great book in which two people fall in love based on their shared love of music. But Infinite Playlist doesn’t have the same depth as that book, so I felt myself longing for more. And that’s why I’m giving this movie a C+.